Treat yourself to a relaxed stay the 4-star Boston Marriott Cambridge. 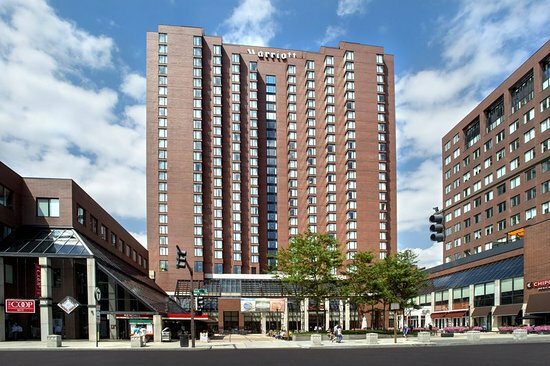 Perfectly located in the lively Kendall Square area of the city, our hotel provides easy access to MIT and Harvard University, and is within easy reach of downtown Boston. Completely renovated rooms and suites offer deluxe bedding, sleek bathrooms, TVs with Netflix and Hulu access and 24-hour room service. Reserve a stay in our M Club level rooms for exclusive access to the Lounge, too. While you're here, you can challenge yourself to a workout in our 24-hour Fitness on Demand. Champions serves tasty American fare, craft beer and great wine, and is a favorite hangout for hotel guests and Cambridge locals alike. Those interested in planning a meeting or event can take advantage of our nearly 13,000 square feet of versatile space, including a rooftop garden with views of the Cambridge skyline. Whatever your reason for visiting, we know you'll be thrilled with your stay at Boston Marriott Cambridge.